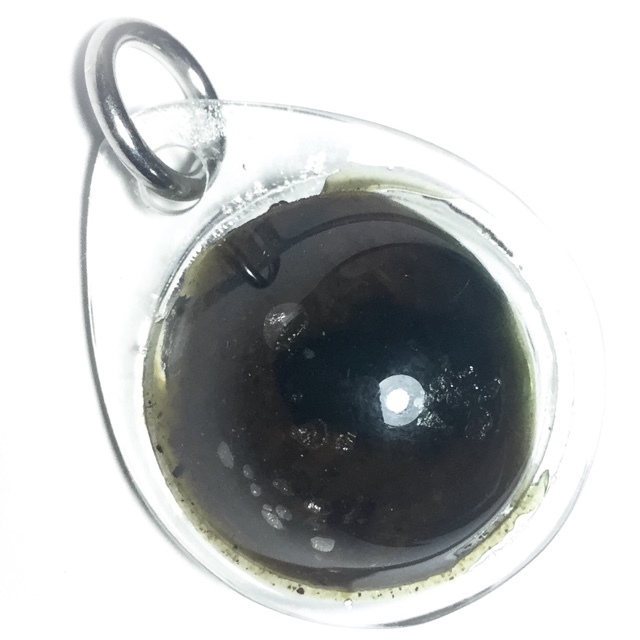 Look Om See Pheung Khiaw Luang Por Tarb, of Wat Mai Grabok Kheun Pheung Sacred Green Prai OIl Potion, encased in spherical waterproof casing as a 'Look Om' wishing ball. The See Phueng Khiaw Green Prai Oil Potion of Luang Por Tarb, was, and still is one of the most highly preferred See Pheung Potions with serious aficionados of the 'Krueang Rang' talismanic amulets Genre. Pra Ajarn Mak, the Abbot of Wat Na Dta Khwan was his Pra Gammawajajarn (Prompting Officer), and Pra Ajarn Ruam, of Wat Ban Laeng, was his Pra Anusawanajarn Witness. Once Luang Por Tarb was Ordained, he immediately showed great effort and strength in his diligent practice, and kept very strict rules with himself. He studied the Dhamma Vinaya , and was already ablte to accurately interpret it for his Professors in Dhamma during his first year of Ordination, showing immense Prowess in his advancements. Apart from his advancements in Dhamma Vinaya and the Pariyatti Dhamma, Luang Por Tarb also made immense efforts to study and discover the secrets of Wicha Akom Buddha Magic and Thai-Khmer Sorcery. He received initiations into Wicha Akom from Luang Por Mak first, and then spent 2 Years of further training under Luang Por Hyaew, to complete his Mastery of the Various Spellcasting Methods, Inscriptions and Formulas for Amulets, and their empowerment. Luang Phu Tim then explained, that he himself had known beforehand that Luang Por Gaj, who was the Master they were seeking for his Wicha Pha Yant Pat Boke, liked to smoke 'Ganja***', and Luang Phu Tim had brought a small bag of it to give to Luang Por Gaj, before asking him for the Wicha. Luang Por Gaj hence was more pleased with Luang Phu Tim for the gift, and parted with the Knowledge of his Pha Yant Pat Boke. The Pha Yant Pat Boke is of course a Famously Powerful Wicha of the Pantheon of Amulets of Luang Phu Tim, and this is indeed where he got the Wicha from during his Tudong travels with Luang Por Tarb. However, it must be said that in olden days Thailand, Marijuana was not illegal, and was a commonly consumed, and common to find product used by Thai Folk of some Regions. It was not hence seen as immoral in those days, there are even folk songs about it. But what is more notable, is that it is questionable as to whether an Ordained monk is practicing Vinaya properly if he consumes an intoxicant? The Rsi Hermits of India consume massive amounts of such substances for meditation purposes, but a Bhikkhu is not a Yogi, he is also a Renunciant, who is attempting to renounce all pleasure seeking. in the end, it s a matter of interpretation as to the rights and wrongs of it, which is also influenced by whether the practitioner is seeking meditation, or pleasure. Either way it is against the Canon. In Thailand Monks are seen to smoke tobacco, which is also against the Canon (arguably). Make what you want of it, Thai Buddhism, and Buddha Magic, is what it is. Luang Por Tarb began to become popular with the local devotees, and news of his powerful See Pheung travelled further afield, until devotees began arriving from distant towns and villages to ask for his See Pheung Khiaw potion. Luang Por Tarb became increasingly popular as news of the effectiveness of his Green see Pheung Khiaw got out, and when the Abbot of Wat Mai Grabok Kheun Pheung passed away, the Devotees begged Luang Por Tarb to take up the task of maintaining the Temple as new Abbot. Luang Por Tarb was unable to refuse their needs, and accepted the task. He fulfilled his duties with rapidity and easy by constructing Kuti monk residences, Vihara shrines, Uposatha Chapel and other great achievements. This increased the faith and popularity of Luang Por Tarb, which began to reach far further afield to other Provinces around Thailand.